Tiffen 58mm Circular Polarizer Filters - Light rays which are reflected become polarized. Polarizing filters are used to select which light rays enter your camera lens. They can remove unwanted reflections from non-metallic surfaces such as water or glass and also saturate colors providing better contrast. The effect can be seen through the viewfinder and changed by rotating the filter. The filter factor varies according to how the filter is rotated and its orientation to the sun. 58mm Circular Polarizing Filter is rated 4.6 out of 5 by 208. Rated 4 out of 5 by DLE471 from Appears to be well worth the money I've used circular polarizing filters for years. I bought some from Porter camera when they were still in business and was satisfied with them. While I haven't had the ones that I got from B&H long enough to be 100% sure, these filters appear to be a notch or two better than the ones that I got from Porter many years ago. If my recollection serves me right, I paid about the same money for these as what I got from Porter. The service from B&H has been marvelous. When I placed my order I somehow ordered the wrong size filter and B&H made exchanging it for the correct filter painless. I would recommend these filters and B&H to anyone. Rated 5 out of 5 by John: Supergeek from Solid Item I have been using this circular polarizer primarily for outdoor photography in hiking and urban settings on my Canon Rebel X2. I quite enjoy it. I have taken maybe 1000 photos with this polarizer since I bought it, and so far I really enjoy the results. I bought it primarily to remove glare from photos with water in it, but I have found a lot more utility in using this polarizer to give some life to a bland sky than I have gotten from other polarizers in the past. I can't think of anything negative to say about this item, it is a solid polarizer. I know there are more expensive ones out there, but I don't think they really serve much more function than this one. Rated 5 out of 5 by Rick W. from Best for non-rotating lenses I bought this pola to use with my new Rebel T3i and its 18-55mm kit lens. It works just fine, given the limits of a rotating front lens element for focus. Unless you use auto-focus (which I often do not) you have a bit of a struggle setting both the focus and also the bite of the pola. If the camera is on a tripod, you can use two hands, one to set and hold the focus, the other to roate the pola itself. The problem lies not with the pola; it lies with a kit lens that sets focus by rotating the front element. As a result, it is not easy to use this filter on this lens. Unfortunately every pola needs to be adjusted into place by rotation, so all polas will produce the same conflict when the front lens element is rotated to set focus. Rated 4 out of 5 by hapkidojoe2000 from This filter works a treat I've been taking a lot of landscape photos, and with this filter on the lens, it really deepens the sky blues quite nicely. It did take several exposures to get just the right effect, and experimenting with it by turning the ring 1/4 turn for each exposure allows me to dial it in. Being new to digital SLRs and using filters, I enjoy just toying with it - and the camera settings. I have not tested the filter on non metalic reflective surfaces yet to see how it performs yet. So far, this filter has done what I need it to, gone are the blown out white skies I used to get. Rated 4 out of 5 by DB from Good for the price The quality of this filter is about what I expected for the price. If you wonder what the differences are between this and a more expensive filter it is all in the feel. In comparison to the two B&W filters I own, the Tiffen just feels...well, cheap. It lacks the feel of a precision machined product. The ring turns a bit too easily and that may lead to unwanted results if you bump it. As far as polarization and clarity it does a very good job, and that's really the bottom line. I echo the comments of other users regarding the threads. The filter is very hard to thread on to my lenses. It took several tries to get it on straight. All in all, polarization is good, but the function and fit leave something to be desired. Rated 5 out of 5 by Anonymous from Great Circular Polarizer, Great Price! Bought this filter for my 1.4 50mm and I also have another Tiffen circular polarizer for my18-200 lens; I love them both! This works great with my fast lens because it is not only a polarizer, but it also takes me down a stop or two which allows me to shoot wide open in daylight. Great product, every lens you own should have one at its disposal, and at the price... its totally doable!!! Rated 4 out of 5 by MusicLover from Work as expected The filter does all it's supposed to do. Only gripe being the narrow screw ring. This is probably a conscious design to keep it thin and avoid vignetting on wide lens, but it's making it a teeth-pulling experience to screw it on/off. Overall very satisfied. It trades off two stops of light with better color and contrast. A must-have for landscape purposes. Rated 5 out of 5 by Foto finder from Top quality filter Tiffin filters are top quality, the filter ring threads are machined precisely and the polarizing filter rotates smoothly. I have been using Tiffen filters for many years and purchase Tiffen because the price is reasonable and the quality is high. I got this for my dSLR, because regular (linear) polarizing filters do not work well with autofocus cameras. Polarizing filters are good for making clouds stand out from the sky in landscapes. Whats the difference of this circular polarizing on the linear? Is circular polarizing works on auto-focus SLR cameras, because I have read about that they are not recommended for auto-focus SLR cameras. How true? 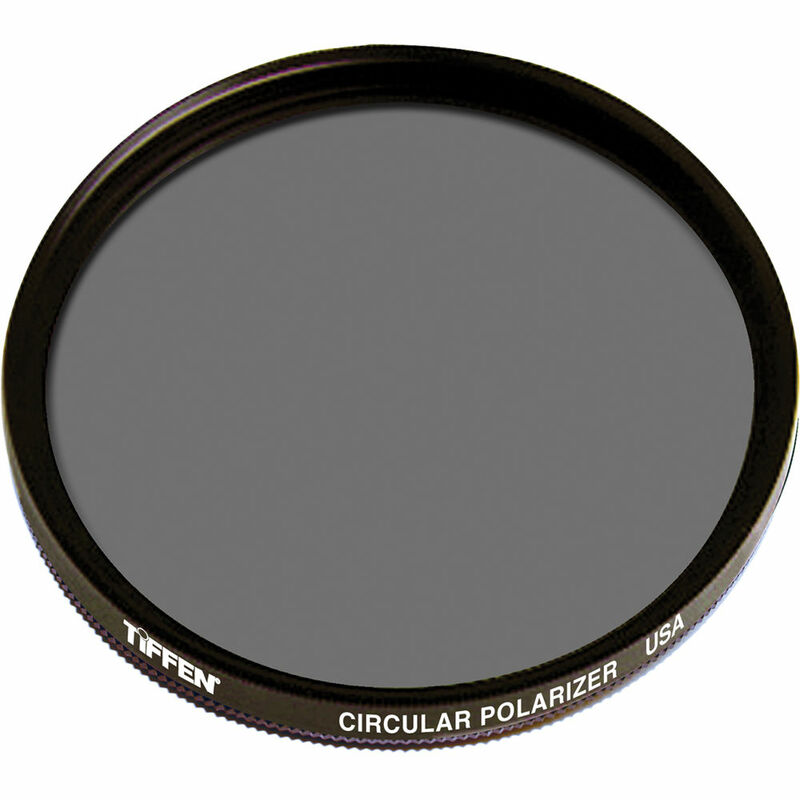 Circular Polarizer are designed for autofocus cameras. Most lenses cannot autofocus with a linear polarizer. If you want to use an autofocus lens you should choose a circular polarizer. Circular Polarizers and polarizers in general are composed of two flat pieces of glass (as opposed to elements which are convex/concave optics used in a lens). Does this fit a Cannon g15 powershot? This filter will fit any lens with 58mm filter threads. The Canon G15 Powershot does not appear to have filter threads at the end of it's lens like most Point &amp; Shoot cameras. Without filter threads it would not be possible to attach a filter.